As the waters cool, opportunities still abound for some spectacular fall fishing. While many are taking to the woods for the fall hunting season, anglers willing to brave the chillier weather can be rewarded for almost every species. For inland lakes, walleyes, yellow perch, and smallmouth bass are prime targets as they put on the feedbag for winter. With the shorter days, the feeding windows are condensed, giving anglers some great chances to intercept the active fish. For walleyes, pulling minnow plugs behind planer boards adjacent to steep break lines remains a great option right at dusk. Anglers wanting to cast shouldn’t overlook the mid-day feeding window with baits like a leadhead jig tipped with a paddle tail soft plastic. Perch anglers can score big with nice jumbos using perch rigs tipped with wigglers or even small perch flies tipped with a small piece of cocktail shrimp. Another favorite option that can really call in some nicer fish is a small jigging spoon with a dropper chain. For some reason, big jumbo perch really like the action of a jigging spoon and will sometimes take this offering when few other things seem to be working. Inland lake bass fishing can be incredible, and the fish on the inland lakes come up to the shallow flats to feed before heading deep for winter. Swimbaits, crankbaits, and even spinnerbaits are all great options to throw this time of year. Don’t be afraid to try skinny water at times if there is sunny weather. It’s not uncommon for smallmouths to roam into water as shallow as four feet or so during the fall feed. This is a time of year when bronzebacks famously “wolf pack”, and locating one in an area generally means that there are many more around. Fall bass fishing in Northern Michigan can be just as good as the spring pre-spawn fishing, but with lots less angling pressure. True, the fall gales can be an issue when planning a trip, but when we have the weather, the fishing can be awesome! The Grand Traverse Bays cool much slower than the inland lakes, meaning that the fish are down in deeper water later into the year, and deep water tactics are the way to go here. Very often, fishing the steep breaks are the way to locate smallmouths as they will venture up onto the breaks to feed, retreating down deep during periods of inactivity. 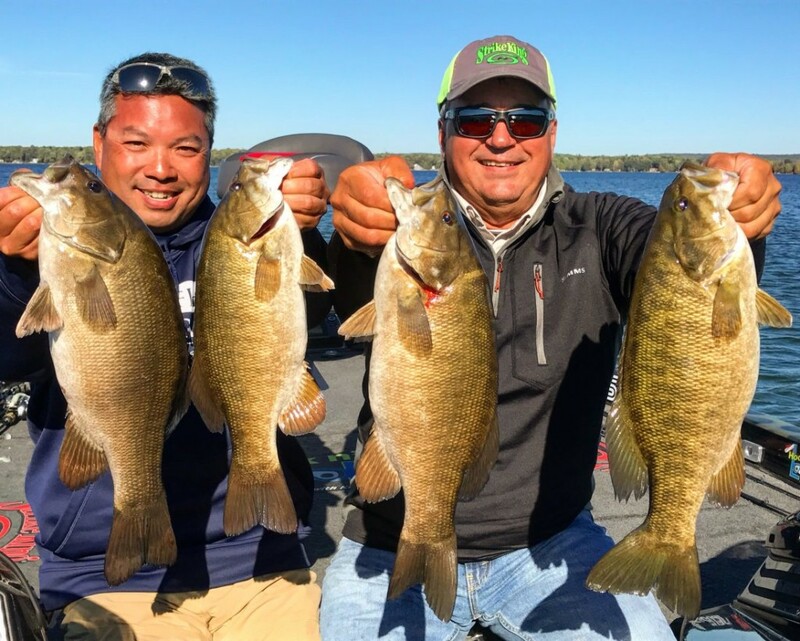 Drop shot techniques, swimbaits and crankbaits are great fall options and are some of the go-to options for Traverse City Bass Guide Service and Sport Fish Michigan. For anglers looking to put some meat into a cooler on the Bays, yellow perch schools are roaming around in huge numbers not seen in years! While many of these schools have 4-6 inch perch, there are some bigger fish around. What is exciting is to see the number of smaller fish, meaning that we should have some outstanding jumbo perch fishing in the years to come if we are careful about not overharvesting this fantastic and tasty fish. Another stellar option is the cisco aka lake herring. With a change in diets over the past several years, they are incredibly good table fare now, and are now exciting more and more anglers. They are extremely plentiful in Grand Traverse Bays, and are super aggressive feeders as well, hitting seemingly anything that comes close to them. Jigging spoons in a 1 ounce or 1-1/2 ounce size are perfect for these fish, as are blade baits. 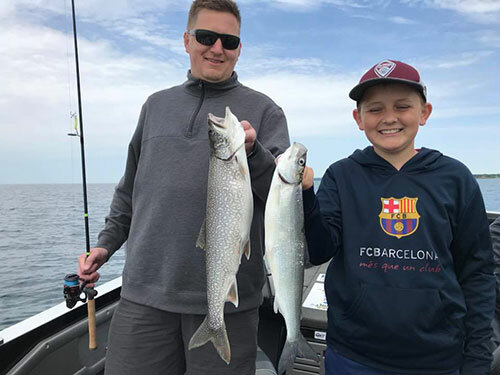 Ciscos these days are running much larger than they ever have, and 4 pound plus fish are common on guide trips this past year for Sport Fish Michigan. Trolling is another productive way to target these fish, but smaller hooks may be the ticket to a higher landing ratio. Cisco fishing is an absolute hoot, and anglers who like to reel in an incredibly hard fighting fish won’t be disappointed! And being outstanding to eat is only a bonus! The Bays are big water, and the fall’s north winds can churn the waters up quickly. Take care when heading out onto any body of water this fall, and make sure to have the proper safety gear aboard. Equally as important is to let others know what your fishing plans are, and where you plan to be. 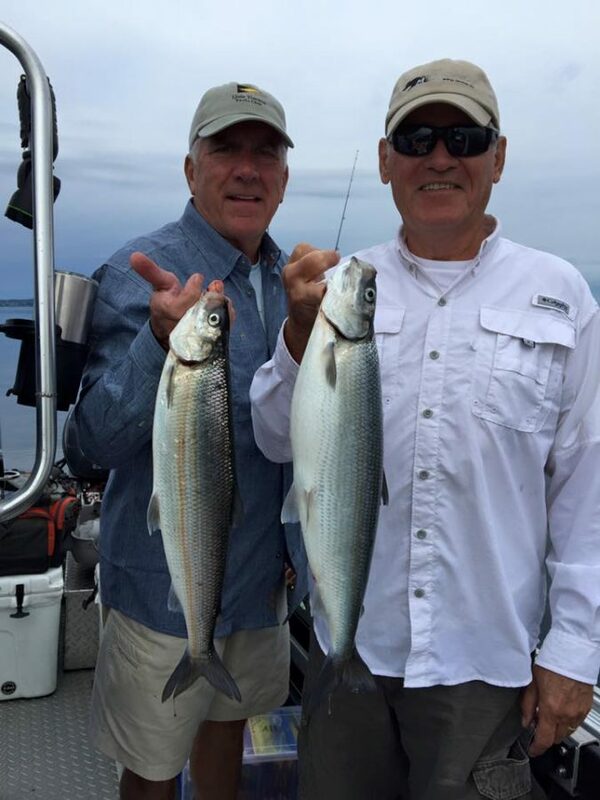 Stay safe, enjoy the fantastic fishing out on Grand Traverse Bays, and catch lots of fish!